Lim Kia Tong has been elected the new president of the Football Association of Singapore (FAS) president, following the national sports association's historic elections on Sat (April 29) morning at the Singapore Sports Hub. Lim & his team of 9, collectively known as Team LKT, beat Bill Ng's Game Changers 30-13 in the closed-door elections at the Black Box Auditorium, with one spoilt vote among FAS' 44 voting affiliates. Either team needed a two-thirds majority to win the election. Team LKT have won the inaugural Football Association of Singapore (FAS) elections held at the Black Box auditorium, with the slate of 9 led by former FAS vice president Lim Kia Tong winning a two-third majority vote, 30-13, against the team led by businessman Bill Ng. The 6 independent candidates who are aligned to Team LKT were also voted into the FAS Council. They are former Singapore internationals Lim Tong Hai & Yakob Hashim, woman's footballer Sharda Parvin, Kelvin Teo, Michael Foo & Rizal Rasudin. This means that Team LKT has effectively swept all the positions on the new democratically-elected FAS Council. The resounding win on Sat (April 29) morning means that 64-yr-old lawyer Lim will now be the new president of the FAS for the next 4 years. Has the Singapore government interfered in the electoral process for the FAS elections? Over the last month, Singapore's government agency Sport Singapore has held meetings with the Ad Hoc Electoral Committee for the Football Association of Singapore (FAS) elections on two occasions. This has now been reported in the mainstream media in both the Straits Times and The New Paper (TNP). The latest story published on 22 April in TNP states that barely 24 hours "after it was raided by authorities", there was a "high level meeting" at the Jalan Besar Stadium. Controversy escalates as Singapore's football body gears up for its inaugural election next Saturday, with claim & counterclaim exchanged yesterday over a $500,000 donation. It started just before 8pm when Mr Winston Lee, the general-secretary of the Football Association of Singapore (FAS), released copies of a letter, cheques & payment vouchers, to make the case that Mr Bill Ng, one of the 2 main contenders in the election, knew about & signed off on donating $500,000 to the Asian Football Federation to help pay for a sports management system, contrary to Mr Ng's earlier claims. Mr Ng's statements are "all patently false", said Mr Lee, and they are "intended to insinuate financial impropriety within FAS" and to damage his credibility and that of the FAS. The top FAS administrator called on Mr Ng to "wholly and unconditionally apologise for his statements". Former Football Association of Singapore (FAS) president Zainudin Nordin, FAS general secretary Winston Lee, Hougang United chairman Bill Ng & his wife Bonnie Wong, were arrested & are currently out on police bail, TODAY understands. The 4 individuals are assisting the Commercial Affairs Department (CAD) with the probe into the suspected misuse of funds at Tiong Bahru Football Club (TBFC), which Mr Ng owns, & an attempt by a senior club official — believed to be Mr Ng — to obstruct the completion of audits of the S.League’s sit-out clubs. 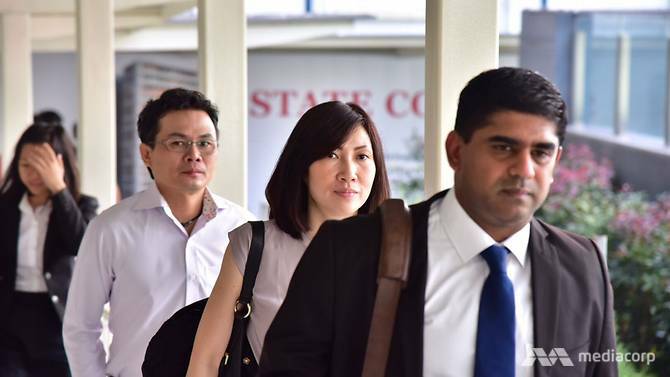 Mr Ng’s lawyer, Mr Shashi Nathan of Withers KhattarWong, confirmed last Friday that the 57-yr-old businessman is assisting police with their inquiries. The Straits Times also reported on Tuesday (April 25) that the bail for Mr Ng had been set at S$100,000. But yesterday, their clubhouse at People's Park Centre closed at 4.30pm, 10 hours before the usual closing time, after it was raided by the police. There were also raids on 2 other premises - Woodlands Wellington's clubhouse in Prinsep Street & Hougang United office at Hougang Stadium - as well as the Jalan Besar headquarters of the Football Association of Singapore (FAS). All 3 clubs are associated with Mr Bill Ng, who is running for president at the FAS election on April 29. The Football Association of S'pore (FAS) has released written proof showing that former FAS president Zainudin Nordin had indeed approached Hougang United chairman Bill Ng to donate money to support the Asean Football Federation’s (AFF) Football Management System, & that Ng had agreed to cough up S$500,000 to do so via Tiong Bahru FC (TBFC), an NFL club which he heads. In a media release on Tuesday (Apr 18), FAS general secretary Winston Lee produced a letter between Ng & Zainudin which showed that the former had agreed to donate to the AFF. In addition, Lee also released payment vouchers signed by Ng which stipulated that the various cheques Tiong Bahru had given to the FAS were meant for the AFF. A day after the local football fraternity was rocked by police raids on the Football Association of Singapore (FAS), & the clubhouses of Tiong Bahru Football Club (TBFC), Woodlands Wellington Football Club (WWFC) and Hougang United, businessman Bill Ng, the man behind the 3 clubs, has been questioned by the Commercial Affairs Department (CAD), his lawyer Shashi Nathan of Withers KhattarWong confimed on Friday (Apr 21). TODAY has also learnt that his wife, Bonnie Wong, is also assisting the police with investigations. The 57-yr-old had visited the CAD’s headquarters late Thursday night (Apr 20) to assist with investigations. All 3 clubhouses were shuttered & padlocked when TODAY visited their premises on Friday (April 21). Shashi, who is from Withers KhattarWong, told TODAY: “I have been engaged to represent Bill Ng, and he has been assisting CAD with their inquiries." Nestled in an inconspicuous corner at the basement of People’s Park Centre in Upper Cross Street, it would be easy to miss the Tiong Bahru FC (TBFC) clubhouse if not for the brightly colored neon lights illuminating its entrance. The clubhouse, which operates from 10am to 2.30am daily, is already a popular haunt for retirees on most days. It became the centre of attention for all the wrong reasons on Thursday (Apr 20) as several of its key assets and documents were seized by a group of people whom TODAY understands to be officers of the Commercial Affairs Department (CAD). This comes following a police report that Sport Singapore (SportSG) lodged against TBFC, which is run by businessman Bill Ng, for suspected misuse of funds, as well as for an attempt by a senior club officer to obstruct the completion of audits into the S.League sit-out clubs. TODAY understands the senior officer refers to Ng. SO MANY accusations left hanging in the air. Allegations of financial impropriety and other shenanigans – all left unsaid. What are we to make of the statements of protagonists in the Football Association of Singapore (FAS) saga and the police action? Everybody’s been coy about joining the dots because they might not draw a pretty, and maybe even defamatory, picture. So what if FAS was the channel? How did Tiong Bahru come to have so much money anyway? So if it’s not illegal, then what’s the problem? Does the saga have anything to do with Mr Ng’s companies? Beware the FAS scandal offside trap! FIFA's 2015 reform package to improve transparency and accountability in the sport includes a call to remove government appointees from leadership of its regional and national administrative bodies. The reformation has seen a fallout in various countries, with political appointees exiting most unwillingly the national administration of their sport. In squeaky clean, corruption-free Singapore, the Football Association of Singapore (FAS) has to comply with FIFA and hold an unprecedented and contentious election for its leadership. Following accusations of a "compulsory donation" to the FAS that was funnelled to the ASEAN Football Association (AFF), the FAS and three football clubs have been raided by Singapore's Commercial Affairs Department (CAD), the clubs' chief, his opponent in the FAS leadership election, and the former political appointee president have been called in for interviews. Instead of reading sensationalist reportage and hack pieces attacking Bill Ng and questioning how his profitable clubs have so many jackpot machines, we invite you to try our serious analysis on the real issues surrounding this case. Team LKT's leader Lim Kia Tong said on Monday (24 Apr), that they had no knowledge of the S$500,000 donation from businessman Bill Ng that went to the ASEAN Football Federation (AFF) in 2015. Mr Lim told the media the matter was never raised at council meetings, "There was no discussion, this subject was never raised at council or ex-co meetings, and that is the truth." “In all honesty, myself plus all the other council members did not know about how and who triggered this idea of donation or sponsorship to the ASEAN Football Federation," he said. For the time being, the FAS story is not about Game Changing. It is quagmired in a Blame Game, in soccer parlance, passing the ball around. And the game is being played rather curiously, with the unsaid and the almost unbelievable testing the thinking public’s patience and intelligence. Police investigations into Tiong Bahru FC’s alleged misuse of funds and purported attempt by a senior officer of the club to obstruct the completion of audits into several non S-League clubs simply means that answers are being sought to even more questions which may yet to be asked. By now, we know that Bill Ng approved a Tiong Bahru FC donation of $500,000 to the Football Association of Singapore. What was it for? Who actually asked for that donation? And why is there a need for everything to be, if not hush-hush, so indirect? I am not a football fan but the saga surrounding the Football Association of Singapore’s (FAS) upcoming April 29 elections has been riveting. 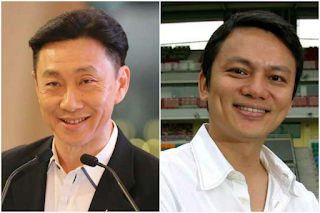 Some might say that challenger Mr Bill Ng’s questions regarding a $500,000 donation he (or his Tiong Bahru FC) made was a distraction and that more attention should be paid to the plans of both teams that are contesting the election. What it shows is that an electoral process brings more scrutiny and urges more transparency from office-holders and those vying for the job. So world football governing body Fifa finally realised that for decades, the FAS was breaking the rules by having officers appointed by the G. After seven years on the job, Mr Zainudin Nordin has stepped down to pave the way for elections. FAS is usually headed by an MP, and the past list included those who have made it into ministerial ranks such as Mr Mah Bow Tan and Mr Ho Peng Kee. How does Bill Ng spend the jackpot money? Reports by Today and The Straits Times on April 25 revealed that former Football Association of Singapore (FAS) president Zainudin Nordin, FAS General Secretary Winston Lee, Ng and his wife Bonnie Wong are currently out on police bail. According to Today, the four were initially arrested before being released on bail “to ensure they will return for further investigations.” The Straits Times reported that the bail amounts differ among the individuals and Ng’s bail had been set at S$100,000. Football Drama: More questions for the FAS before the upcoming election. Former Football Association of Singapore president Zainudin Nordin has been arrested as police probe his involvement in a suspected misuse of club funds at Tiong Bahru Football Club and an attempt to obstruct audits into clubs. Zainudin, who stepped down from his post as FAS president last year, was also a PAP MP for Bishan-Toa Payoh GRC and Mayor of Central Singapore Community Development Council until 2015. Others arrested in the probe include Bill Ng, the former chairman of Tiong Bahru football club, Ng’s wife, and Winston Lee who is currently serving as FAS secretary-general. All 4 of them are now out on bail. The former MP has claimed that he has already resigned from his Football Association Singapore (FAS)’s President post when he took up the “adviser” position at the donor’s company (ESW Manage). However, the owner of ESW Manage, Bill Ng, said that the former MP was the one who asked for a S$500,000 donation to FAS. It is understood that the S$500,000 donation could be a condition for Zainudin Nordin to resign his FAS’s position and join the company. Deleted webpages of ESW Manage however shows that Zainudin Nordin was both FAS President and ESW Manage’s director (as compared to the “adviser” position he claimed. Bill Ng, his wife and FAS’s general secretary Winston Lee have also been arrested and are currently out on bail. Funny, because the calls only come now in the wake of the CAD investigations on the alleged misuse of Club funds in the FAS and Bill Ng saga. These clubhouses have been around for ages, and their presence and the income they generated are not exactly secrets. In fact, many times a football club have indicated that they jackpot machines are actually a steady source of huge income for their clubs to run their operations. Funny, because now the MPs are all making noises, when in fact the could have done so before this become a matter of public interest. Are these MP jumping on the bandwagon to make their presence known, and their roles as MP, relevant? Funny, because at the centre of this storm, was an ex MP and PAP man himself, Zainudin Nordin. He certainly did not voice out for tighter rules on jackpot operations. He, of all people, should know about the existence of the machines. After all, he was the FAS president. He cannot claim ignorance, can he? The Today newspaper reported that former PAP MP president Zainudin Nordin was arrested along with Hougang United chairman Bill Ng and his wife Bonnie Wong, and Football Association of Singapore (FAS) general secretary Winston Lee. Mr Zainudin (who is also the former FAS chief) and the others are currently out on police bail. The four of them are assisting the Commercial Affairs Department (CAD) in a case of improprieties at FAS’ local soccer clubs. Despite being arrested, the four have not been charged by the police for any crimes yet. Today reported that those that wanted police bail first have to get arrested before one is offered to them. The CAD investigations centers on Mr Ng’s $500,000 donations to FAS. Former Member of Parliament (MP) for Punggol East, Lee Lilian, has expressed disgust that the newspaper report did not mention that one of the person who was arrested is an ex-People’s Action Party (PAP) MP. Ms Lee is a member of the Workers’ Party. Really, nothing against the people involved. It was reported on Tuesday (April 25) that Mr Zainudin Nordin, the former president of the Football Association of Singapore (FAS), was arrested over the suspected misuse of funds at Tiong Bahru Football Club, along with 3 others. While the headlines seem rather normal to most, former Worker’s Party member of Parliament Lee Li Lian was extremely triggered by the headline and took to a Facebook post to call the mainstream media out for their “double standards” — because they failed to mention that Mr Zainudin used to be a People’s Action Party (PAP) member of Parliament. The unclear distribution and usage of a huge donation that had been given to the Football Association of Singapore (FAS) have caught the attention of SportSG, who has called for a full explanation from the organisation. Today Online reported that SportSG, the governing body of local sports, noticed the huge figures moved around and sent a statement to the media on Sunday (16 Apr), calling on FAS 'new council' for a full explanation over its usage of donations made by Bill Ng. Hougang United chairman Bill Ng, had donated close to S$850,000 to the national football body at FAS’s request, but he has called for a full explanation from FAS over its usage of the donations. $500,000 “donation was a matter between” former FAS chief & Bill Ng? As to “The other main point of contention – who asked for the donation? Mr Ng maintains it was Mr Lee, while Mr Lee and Team LKT say the donation was a matter between Mr Zainudin and Mr Ng, although Mr Lee said that he saw nothing untoward about that arrangement. “FAS Council approval was not needed and not sought because this was a donation which Bill Ng made to AFF, not FAS. I am thus puzzled as to why Bill Ng and the Game Changers have made various unfounded accusations against me, when this matter was discussed and concluded between him and Zainudin directly, as Bill Ng’s own letter clearly shows,” said Mr Lee” – how can an organisation with IPC (Institution of Public Character) status imply that a huge $500,000 donation to a foreign party routed through it (paid to FAS) – “say the donation was a matter between Mr Zainudin and Mr Ng, although Mr Lee said that he saw nothing untoward about that arrangement” and “FAS Council approval was not needed and not sought because this was a donation which Bill Ng made to AFF, not FAS”? The Football Association of Singapore (FAS) has vowed to amend its constitution next year after FIFA demanded an end to political interference in the appointment of the national body's council members. FAS' decision to comply comes about five months since FIFA suspended Indonesia, after the Jakarta government sought to oust the country's football association. In a statement issued late Wednesday, September 30, FAS said it will work closely with FIFA on amendments that will "ensure alignment" of its election process with the statutes of the sport's global governing body. The People’s Action Party’s long association with the Football Association of Singapore (FAS) now seems to have come to a sad end. This is in light of news, 25 April, that its last-appointed President of the FAS – former Mayor and former PAP Member of Parliament, Zainuddin Nordin – is under police investigation and is currently out on bail. Also out on bail are the owner of Tiong Bahru Football Club, Bill Ng; his wife, Bonnie Wong; and Winston Lee, former general-secretary of the FAS. related: REMEMBER SYLVIA LIM’S RALLY SPEECH ABOUT FAS BEING HEADED BY POLITICIANS? “These reforms are moving FIFA towards improved governance, greater transparency and more accountability. They mark a milestone on our path towards restoring FIFA’s credibility as a modern, trusted and professional sports organisation. This signals the beginning of a culture shift at FIFA. It is important to recognise that today’s recommendations build on the foundations established by the IGC in 2011 under Mark Pieth’s leadership, which included the creation of an independent chairman on the Audit and Compliance Committee and splitting the Ethics Committee into investigative and adjudicatory chambers,” explained FIFA’s Acting President Issa Hayatou. "Prime Minister Lee Hsien Loong’s government responds vigorously to criticism from journalists and does not hesitate to sue its detractors and apply pressure to make them unemployable, or even force them to leave the country. The Media Development Authority has the power to censor journalistic content, both in the traditional media and online. Defamation suits are common in the city-state and may sometimes be accompanied by a charge of sedition, which is punishable by up to 21 years in prison. The range of issues and public figures that are off limits for the media is growing. Journalists refer to the red lines as “OB markers” (for out-of-bounds markers)." Singapore's World Press Freedom Index increased by three ranks this year, as compared to last year. A report by Reporters Without Borders (RSF) reflected Singapore being in the 151st place this year. In 2016, Singapore was in the 154th rank. Hong Kong fell to the 73rd rank from 69 in 2016. Singapore has moved up 3 places in the 2017 World Press Freedom Index compiled by Reporters Without Borders (RSF). It is now ranked at 151. Singapore is not in the RSF’s black zone, but is ranked near third world countries like Ethiopia, Swaziland and Democratic Republic of Congo. The Index unveiled woes and ills that are obstacles to media freedom throughout the world. It reflects a world in which attacks on the media have become commonplace and strongmen are on the rise. RSF said “we have reached the age of post-truth, propaganda, and suppression of freedoms.” It described Singapore’s government as being ‘intolerant’ and charged that the media here practised ‘self censorship’. Is Taiwan’s Freedom Better than Singapore's ‘Caged Canaries’ and Hong Kong’s 'Lost Soul’? However, Ko's remarks about Singaporeans being “caged canaries” largely went unchallenged. It did not evoke a response from any of Singapore’s political leaders or civil society, perhaps a reflection of the subdued behavior that has evolved in the island state. The 2016 edition of the World Press Freedom Index, which Reporters Without Borders (RSF) published on 20 April, 2016, shows that there has been a deep and disturbing decline in respect for media freedom at both the global and regional levels. Ever since the 2013 Index, RSF has been calculating indicators of the overall level of media freedom violations in each of the world’s regions and worldwide. The higher the figure, the worse the situation. The global indicator has gone from 3719 points last year to 3857 points this year, a 3.71% deterioration. The decline since 2013 is 13.6%. As the saying goes, with more power comes more responsibility. If you're turning 40 within the next couple of years, you'll realise that the same thing happens when you hit a milestone age – you become wiser, more experienced, and more likely than not, find yourself with more responsibilities, especially where your money is concerned. You might also have heard of this saying: knowledge is power. So read on, and get started on these must-dos for a "powerful" 40th birthday. As you earn more, spend more wisely. By your mid-30s, you're likely to be in a more powerful position in terms of earning capabilities, as compared to your 20s. 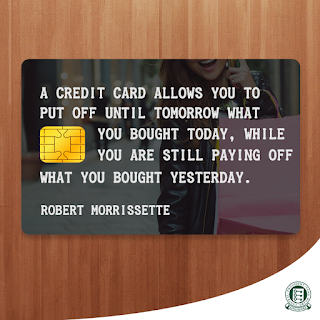 But at the same time, you're also likely to have more wants and needs, which might translate to higher expenditure and bigger debts. 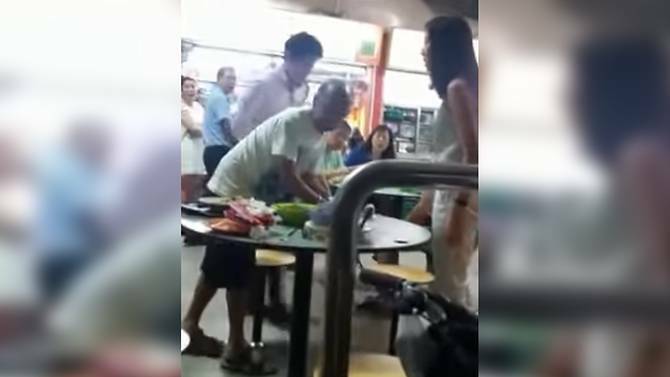 The couple who got into an ugly spat with an elderly man at a hawker centre in Toa Payoh was handed a S$2,700 fine on Friday (Aug 11). Chow Chuin Yee, 46, was fined S$1,500 for using criminal force on 76-yr-old Ng Ai Hua, by using his upper body to forcefully barge into Mr Ng. Chow’s partner, Tay Puay Leng, 39, was fined S$1,200 for using abusive words on Mr Ng with the intent to cause alarm. The couple who bullied an ah pek at a hawker centre in Toa Payoh Lorong 8 in in April have been charged in court. 45-year-old Chow Chuin Yee, who barged into the 76-year-old ah pek from behind, was charged with using criminal force. 38-year-old Tay Puay Leng was charged with intent to cause alarm, after she was caught scolding the ah pek using vulgar language. Chinese Daily Lianhe Wanbao today exposed the ugly past of the man who banged an elderly man at Lorong 8 Toa Payoh hawker centre. 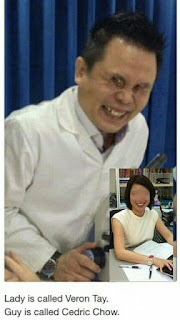 The man who has since been identified as Chow Chuin Yee, a director at Novel Learning Centre. The Chinese Daily quoted a 60-year-old neighbour saying how Chow banged on his shoulder and taunted him after doing so. He later made a police report on the elderly man. 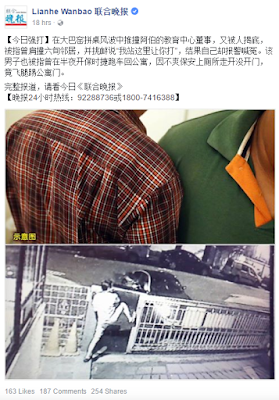 The neighbour who declined to be named said he was returning home with two large bags after grocery shopping, when Chow deliberately knocked into him to get into the lift. Before anything, here’s something you should consider: this entire story is being told by one neighbour. If this is untrue, then the TPY Bully must have had made someone really unhappy. If this is true, then the TPY Bully would have made many Singaporeans really unhappy. 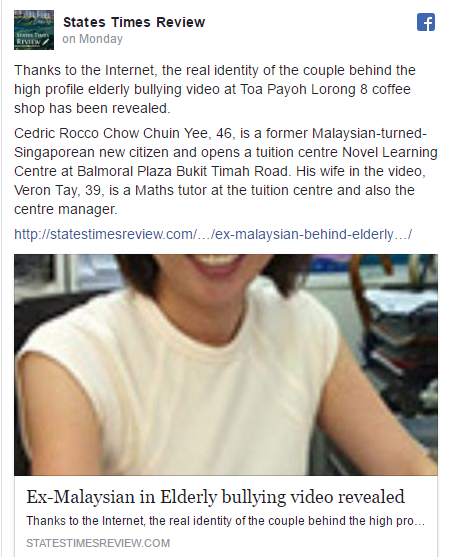 Thanks to the Internet, the real identity of the couple behind the high profile elderly bullying video at Toa Payoh Lorong 8 coffee shop has been revealed. Cedric Rocco Chow Chuin Yee, 46, is a former Malaysian-turned-Singaporean new citizen and opens a tuition centre Novel Learning Centre at Balmoral Plaza Bukit Timah Road. His wife in the video, Veron Tay, 39, a Singaporean citizen, is a Maths tutor at the tuition centre and also the centre manager. The tuition centre’s Facebook page and website has since been deleted after Chinese newspaper Zao Bao confirmed their identity. The couple were arrested following multiple police reports made on the video. Investigation by Sin Ming Daily Paper has identified the couple that was featured in the recent viral video at a Toa Payoh Hawker Centre, as a director and an educator at a local tuition centre. According to the Chinese Paper, its investigations has confirmed that the 46-yr-old male is a director of a tuition centre and the 39-year-old who is the wife, Ms Vernon Tay is a mathematics teacher at the same centre. It revealed that based on information from ACRA, the tuition centre was formed in May 2011 with three directors, including the male who is involved in the incident. The male is also a director of two other companies, one providing higher education courses while the other, is a renovation company. While the Chinese Paper has noted the position of the director but the actual identity of the male director cannot be identified at the moment because ACRA's website is under maintenance. It is noted that the website's page on the centre's teachers has been removed. 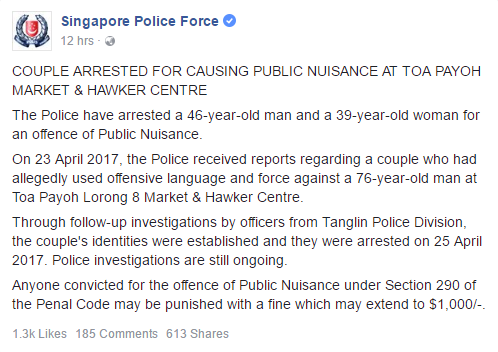 Police on Tuesday (Apr 25) arrested a 46-yr-old man and a 39-yr-old woman for causing public nuisance at a hawker centre in Toa Payoh. 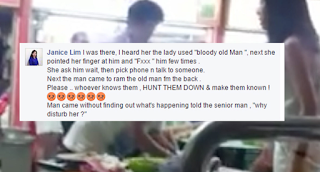 In a statement, the police said they received reports on Sunday about a couple who allegedly used offensive language and force against a 76-yr-old man at Toa Payoh Lorong 8 market & hawker centre. Investigators established the identities of the 2 people and they were arrested. Investigations are ongoing. The Police have arrested a 46-year-old man and a 39-year-old woman for an offence of Public Nuisance. 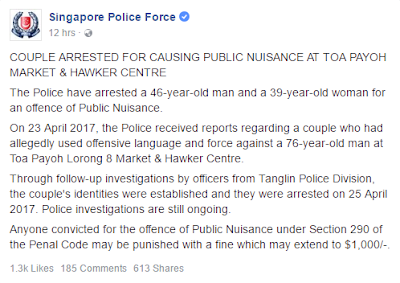 On 23 April 2017, the Police received reports regarding a couple who had allegedly used offensive language and force against a 76-year-old man at Toa Payoh Lorong 8 Market & Hawker Centre. Through follow-up investigations by officers from Tanglin Police Division, the couple's identities were established and they were arrested on 25 April 2017. Police investigations are still ongoing. Singapore’s idiosyncratic “chope” culture also brought into question if such a practice was a practical life hack, or simply ungracious. On one hand, choping seats ensures that we do not have to end up carrying our food around in circles while looking for a seat, or have our food turn cold. On the other, reserving of seats could seem unfair to those who have already bought their food and are in search of a seat. 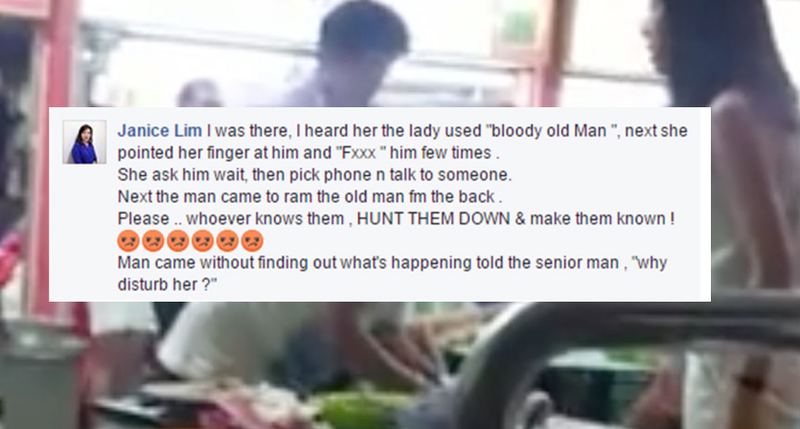 It also disadvantages elderly patrons like the one in this Toa Payoh incident. According to The Sunday Times, this habit of reserving seats is not practiced in overseas. A lady said that in Hong Kong, they actually moved their things away if someone wanted to sit, and felt that choping was strange. Foreigners who were brushed away by locals defending their reserved seats felt that our “chope” culture had tarnished their image of Singapore. So should we chope or not? Personally, I feel that we should always exercise kindness and consideration for others, and practice a spirit of give-and-take empathy. We should at the very least, share seats at a table and not chope more seats than necessary. CHOPE! I CHOPE! This seat is mine! On April 22nd, 2017, Facebook User Manny Quest uploaded a footage of a heated dispute between a young couple and an elderly man that occurred a day before. 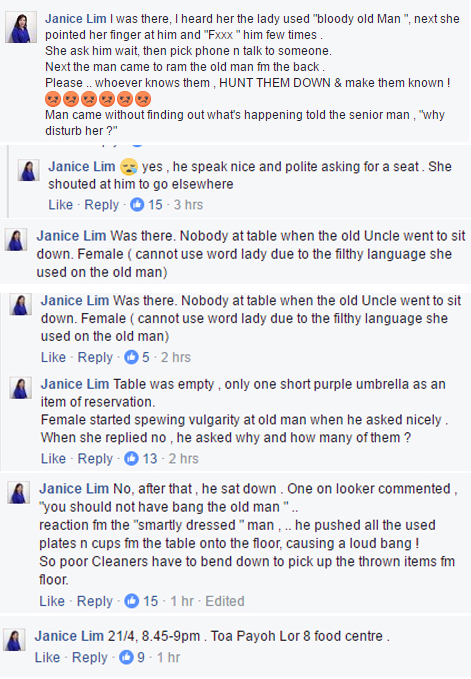 The video begins with the lady arguing with the old man on the issue of the “reserved” seats or as we Singaporeans affectionately call “choped” seats. At around the 22-second mark of the footage, a man, presumably her boyfriend, bumped against the elderly man, causing the old person to stumble forward. It could have been a hard fall, but fortunately, the old man steadied himself by grabbing hold of the hawker table. On 25th April 2017, the police arrested the couple involved in the incident for causing public nuisance. 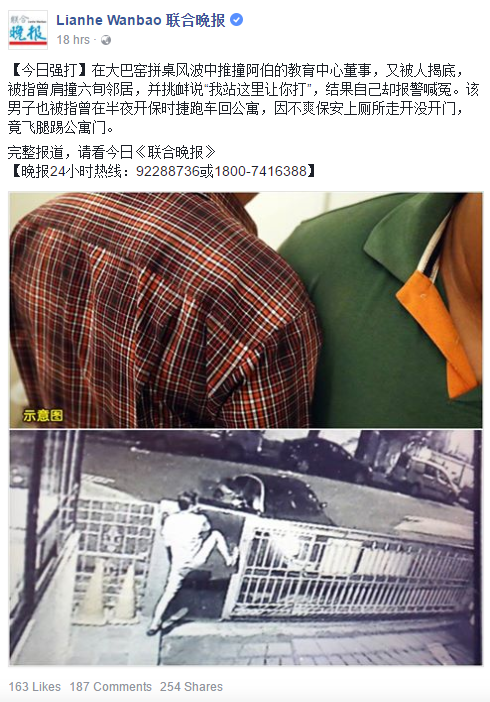 Why has the couple been arrested for public nuisance? What constitutes to the charge of public nuisance? What are the punishments that can be enacted on a person if convicted for the charge of public nuisance? A 46-year-old man and a 39-year-old woman were arrested for the offence of public nuisance, the police said in a statement early Wednesday (26 April). The police said they had received reports on 23 April regarding the couple, who had allegedly used offensive language and force against a man, 76, at Toa Payoh Lorong 8 Market and Hawker Centre. A recent online video showing the encounter has gone viral. 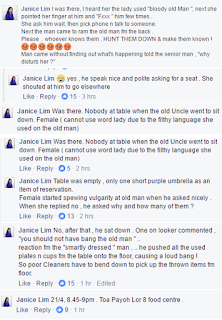 Facebook user Janice Lim, who said that she was at the scene, recounted that after an elderly man approached a table with the intention of occupying a seat, a woman claimed that it was “reserved” with a folded umbrella and told him off. After an eye witness at the Toa Payoh Lorong 8 Market and Food Centre pushing incident, Janice Lim, came forward to share the full account of what actually happened on the scene, the daughter of the victim has stepped forward too to give her account. Caroline Ng expressed anger and disgust over what happened to his dad and condemned the actions of the couple involved. She also thanked the Singaporeans who showed support for his dad. However, she caution against any online vigilantism, appealing to the public to submit any information regarding the couple to the police or relevant authorities instead of trying to take things in their own hands. One online vigilante, Ang Tock Seng, learned his lesson the hard way, being the subject of an online CSI now after he wrongfully fingered a Cherry Tan as one of the culprit in the pushing incident. Ng also shared that she might be pursuing a civil lawsuit against the couple. Whoever they are, they probably are having a hard time sleeping now. Our hawker and food centres are public places. Seatings are first come first serve basis. While I understand it's common practice for many of us (including myself) to leave an artifact to reserve seats while queuing for food, since when does this equate to entitlement or ownership of these public items? To get in depth with Singapore's infamous "chope seat" system will require a whole separate discussion, which I am not about to get into here .... Bottom line is (doesn't matter who is there first), my dad only wanted to share the table, there were only 2 of them (the couple) and their food wasn't even ready .... Will it kill them just to share the seats??! I mean .. seriously??!! Not only the woman was uncouth with her hurling of abusive profanities, her companion just had to despicably ram my dad from behind, trying to knock him off his feet! ... no matter who is in the right or wrong, nobody should be treated in this manner, let alone to an old folk. 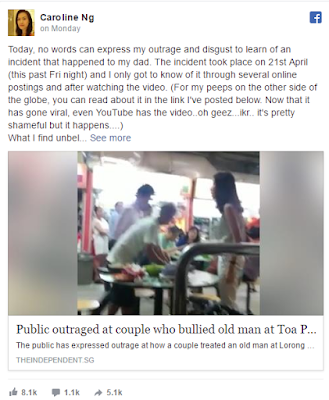 We got in touch with Janice Lim, identified via her Facebook comments on the viral video to be a credible first person witness when the pushing incident happened at Toa Payoh Lor 8 Market and Food Centre last night. 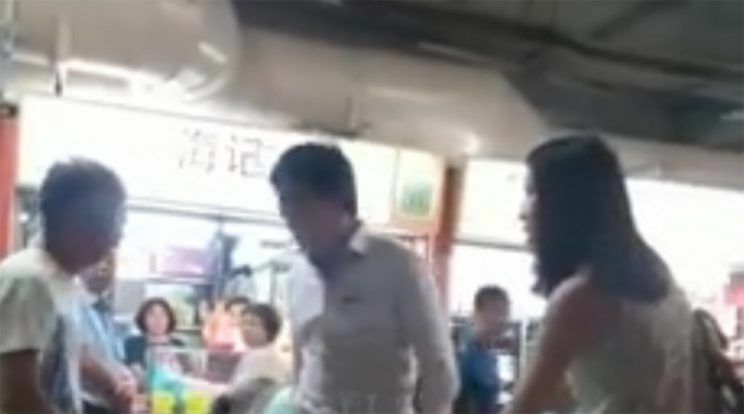 In the video, a well-dressed lady is seen arguing with an old man over the seats at a round table in the hawker centre. She called someone for help and an equally well-dressed young man came to her rescue, shoving the old man from behind, causing him to fall forward. The spat at a Toa Payoh hawker centre over the reservation of seats led to readers writing to the Forum page calling for a ban on "choping". Here are some excerpts from the letters. The incident highlights the need to address this anti-social behaviour. I have no issue when a person sits at a table and reserves it for his friends or family. 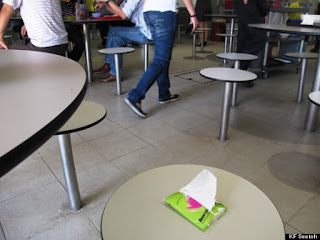 But I do find it inconsiderate when tissue packs, name cards, umbrellas and other objects are used to "chope" a table. I have witnessed overly-cultured and genteel visitors from strange lands descend onto our popular hawker centre (where they serve flavors that define the country’s culinary culture), at mad peak hour moments and wonder, “Ahem, so is someone going to show us to a table for 4?” Not going to happen ma’am. The technique of securing seats at those feeding frenzy hours had long ago been reduced and translated to a fine art form called “chope.” The first thing chope master artists do is to hone in on an empty table and mark their turf — by putting the cheapest or most useless personal item they have on them, usually a half used tissue pack, a cheap ball point pen or even a worthless bargain stall umbrella on the seat. That, in mod-Singapore street food speak, means “lay off, she’s taken,” or in local vernacular called Singlish “Chope, this seat mine” (a local English slang, sans the polite grammar and attitude the British left us with). A video of a woman and an auntie engaged in an altercation over an MRT reserved seat has been circulating on Facebook. Perks for Residents' Committee Volunteers?